My beloved wheat pack was getting rather threadbare, but when I finally found an actual hole in it, I knew something had to be done, because I really would rather not wake up in a sea of wheat. 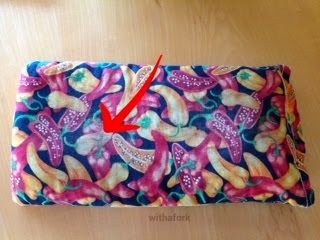 Fortuitously, Mr Fork had alerted me that a pair of his flannel pyjamas had busted a seam recently, and close inspection really deemed them beyond all hope of repair (I had already fixed them a number of times but they were a favourite). So I took these two events as a sign that I should make a new cover out of his lovely soft monkey pyjamas! 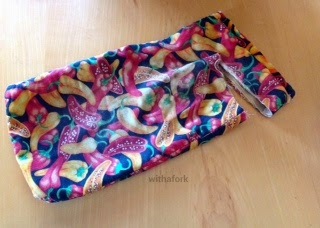 It was a relatively simple project that really needs only very basic sewing skills. 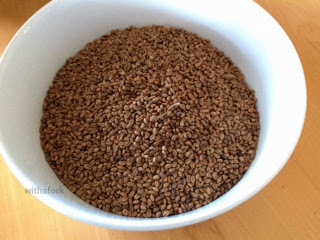 The old wheat pack was cut open and the (well roasted but perfectly useable wheat) was decanted into a large bowl. I took the pants legs, where the material was still nice and thick and cut four rectangles from the bottom, a little larger than the size I wanted the wheat pack to be. My old pack was lined, and I saw no reason to deviate from that, hence four rectangles. I hemmed it all together around three edges, then turned it right way out. In this case, it didn't really matter so much because I did the lining the same as the outside so I didn't have to be overly concerned about how the material was facing. The wheat was carefully poured back in via a stiff piece of card which acted as a funnel. I then just turned the ends in on themselves and sewed across the opening a few times. And it was done! 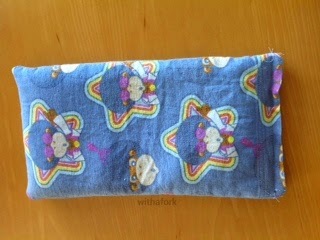 I now have a funky new flannel covered wheat pack with happy monkey faces. My achey pregnant self is grateful! 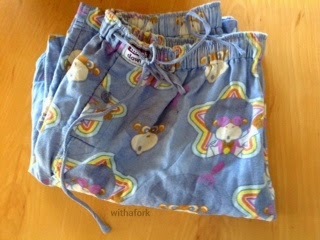 I'm thinking of taking the tops of the pyjama pants and making mini pants versions for Ellie and Attila. Have you saved anything from being thrown out lately and repurposed it? Thanks Kari! I love that we get to keep those monkeys around a bit longer. I'm a little fond of their cute faces!